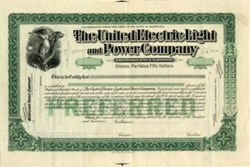 Beautifully engraved Specimen certificate from the United Electic Light and Power Company printed in 1899. 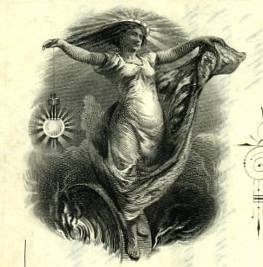 This historic document was printed by Western Bank Note Company and has an ornate border around it with a vignette of allegorical woman holding an electric light while flying in the clouds. Following the introduction of Edison's invention, electric company competition was fierce, yet service was inconsistent. Power plants were small and inefficient, rates varied widely, and distribution amounted to a tangle of duplicated and overloaded overhead lines. The United Electric Light and Power Company emerged as a pillar in its field, and in 1906, it joined with Consolidated Gas to become Consolidated Gas Electric Light and Power Company of Baltimore - the city's first fully integrated gas and electric service company. The company subsequently The Company changed its name to the Baltimore Gas & Electric Company.